Dr. Gary Sasaki’s history is rooted in Detroit, Michigan. He grew up in Detroit, and received his Dental Degree from the University of Detroit-Mercy School of Dentistry. While establishing his dental practice in Ypsilanti, Michigan, he taught at the University of Detroit-Mercy Dental School until 1979. He then received a Master’s Degree in Crown and Bridge Dentistry in 1981 from the University of Michigan School of Dentistry. He continued teaching part-time at the School of Dentistry for the University of Michigan until 1989. Dr. Sasaki has continued this educational relationship with U of M as a guest lecturer, and has many hours of continuing education credits in all phases of dentistry. Dr. Gary Sasaki has been married for 30 years and has two adult children in health care professions. He enjoys spending his time golfing, playing tennis, exercising, traveling and eating all types of food. As an upstanding member of the community and the American Dental Association, you can expect nothing but the best, most conscientious care from him. 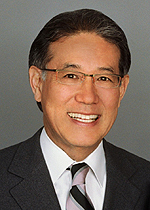 As well as a deep commitment to honesty and integrity, Dr. Sasaki is proud of the high quality of dentistry his office provides and the comfort of his patients.